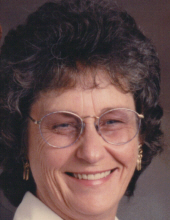 Ruth Ann Pollock, 77, of Walcott, died Monday at her residence. She worked at Greene County Tech and was a member of Mt. Zion Baptist Church. She loved horses and art painting. She was preceded in death by her parents, Roy Bowlin and Rosa Lee Elliott Bowlin and 3 brothers. Survivors include her husband, Charles Dean Pollock of the home; sons and daughters, Angela (Randy) Watson of Jonesboro, Belinda Crawford of Jonesboro, Phillip (Tracy) Pollock of Jonesboro, Sarah French of Jonesboro, Tim (Kelly) Pollock of Paragould. 15 grandchildren and 4 great grandchildren. Visitation will be Wednesday from 5:00-8:00 PM at Heath Funeral Home. Graveside services will be Thursday at 10:00 AM at Mt. Zion Cemetery with Clint Burns officiating. Memorials may be made to Dierksen Hospice. To send flowers or a remembrance gift to the family of Ruth Ann Pollock, please visit our Tribute Store. "Email Address" would like to share the life celebration of Ruth Ann Pollock. Click on the "link" to go to share a favorite memory or leave a condolence message for the family.